Cub Cadet has been in the lawn mowing business since the very beginning. Originally a product of the now defunct International Harvester company, Cub Cadet lawn tractors were designed with the ‘smaller’ jobs in mind ( less than 3 acres). The quality and innovative designs made this brand an instant hit with consumers. The brand continues to be somewhat of a legend among homeowners. The front axles on all Cub Cadet tractors is fabricated of cast iron. This is the sturdiest material available for a lawn tractor front axle. The deck design on all the Cub Cadet lawn tractors feature the ‘step through’ design. This eliminates any obstructions in front of the drivers seat. This allows for easy entry and exit from the tractor without the need to lift feet and legs over a raised portion of the frame. 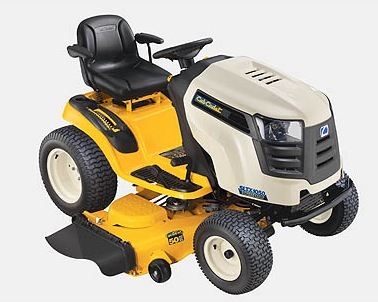 Cub Cadet lawn tractors are available in several model series - the 1000; 1500; 2500; and 3000. The series 1000 and 1500 are considered to be lawn tractors. The 2500 and 3000 series are in the garden tractor category. Price and features multiply with increasing series number. The 1000 series models are a high quality mid level entry machines, with five different versions offered. The 1500 series( two models) and 2500 series ( four models) would be considered upper end of quality and features. The two models series 3000 would be near the ultimate for a homeowner lawn tractor. The 1000 series offers a choice between a single cylinder 19 HP Kohler Courage engine; a 22 or 26 HP Kohler twin cylinder engine; or a 24 HP Briggs and Stratton twin cylinder engine. All versions of the engine feature a pressurized oil system, with a replaceable oil filter. The three lower priced models in the Cub Cadet Lawn Tractors 1000 series` have a manual PTO used to engage the cutting blades. The 42” or 46” cutting deck has twin blades. All other models have an electric PTO, which is engaged by flipping a switch. Count on spending between $1500.00 to $2000.00 for the tractors in the 1000 series. The 1500 series offers a choice between a twin cylinder 27 HP Kohler engine; or a 26 HP Briggs and Stratton twin cylinder engine. Both versions of the engine feature a pressurized oil system, with a replaceable oil filter. Both models have an electric PTO, which is engaged by flipping a switch. The cutting deck width is s hefty 54”, and uses a triple blade deck design The deck is removed using the ‘Quick Attach” system, which requires no tools. This is very handy, indeed! The price? Between $3000.00 to $3200.00 for the tractors in the 1500 series. The 2500 series offers a choice between a twin cylinder 27 HP Kohler engine; or a 26 HP Briggs and Stratton twin cylinder engine. Both versions of the engine feature a pressurized oil system, with a replaceable oil filter. A shaft drive connects the powerful engine to the transmission without the use of a drive belt. This provides increased power delivery to the wheels, and needs less maintenance. Both models have an electric PTO, which is engaged by flipping a switch. The cutting deck width is either 42” (twin blades) or or 44” ( triple blades). Cost range is between $3500.00 to $4400.00 for the tractors in the 2500 series. The 3000 series offers a choice between a twin cylinder 23 or 25 HP overhead valve (OHV) Kohler engine. Both engine versions feature a pressurized oil system, with a replaceable oil filter. A shaft drive connects the powerful engine to the transmission without the use of a drive belt. This provides increased power delivery to the wheels, and needs less maintenance. Cruise control is standard. Both models have an electric PTO, which is engaged by flipping a switch. The cutting deck width is either 44", 50", 54", or 60", with all widths featuring triple blades. A mulch kit is available on some models. The deck height is adjusted by a hydraulic mechanism, with fingertip controls. This kind of quality is not cheap! Cost range is between $5200.00 to $6200.00 for the tractors in the 3000 series. Most customers that purchase a Cub Cadet lawn tractor buy another in the future, based on high satisfaction and legendary performance.